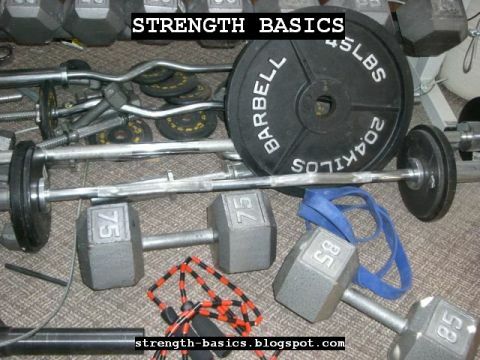 Strength Basics: Strength: General or Specific? In general, when you learn about strength training in textbooks, they tell you that strength is general, not specific. That is, it's not a skill-specific or application-specific. Get your skeletal muscles stronger, you improve at all strength-related activities. Do some rows, some pressing, and some deadlifting, and moving furniture, grappling strong foes, and opening stuck jars all get easier. But sometimes the idea that strength is general is taken further than I think it should be. 1 Rep Max Rules All? I've seen it written that if you can get your 1-rep maximum up, you automatically increase the number of reps you can do with lower weights. After all, they represent a decreasing percentage of your maximum strength. Therefore, they cost less energy and effort, so you can do more. The argument usually says that the opposite is not true: raising your ability to lift a lighter weight for more reps won't help your 1-rep max. Short version: up the weight you can lift once, it raises everything. The opposite? No. But I'd argue that strength adaptations are specific. Training in the 1 to 3 rep maximum range will increase your maximum strength but not do much for your endurance. Your body will adapt to the demand - get stronger at heavy weights - and not the implied demand - get more endurance for lower weights. While those reps may be easier, you haven't placed much emphasis on increasing your strength-endurance so you won't do as many as someone who trains for maximum reps at that lower weight. In my experience, if you up your 1-rep max your 10-rep max weight will go up a little, but you won't necessarily see it go up a lot . . . and not as much as if you specifically train for 10-reps. Same thing the other direction. My former MMA coach has said he'll do bench flys for 100 reps with 35 pound dumbbells, but would probably only get 40s for 10. Why? He's training specifically for strength-endurance, not maximal strength. It's a tradeoff. It wasn't about getting lifting heavier, but lifting a specific weight over and over. There is a famous story of a squat competition between Tom Platz, a bodybuilder, and Dr. Fred Hatfield, a powerlifter. The story goes that Dr. Hatfield out-squatted Tom Platz for maximum weight, but at lower weights he couldn't keep up with Platz's number of reps. It's anecdotal but informative - you get better at what you train to do. Can't I do both? Yes, you can. If you do both, you might compromise one or the other, but give up the maximum possible weight or maximum possible reps to get some overall general utility. This is why many programs include multiple rep ranges - the high rep accessory work of 5/3/1 (and it's "as many reps as possible" final sets and the mix of low rep heavy pressing or squatting with higher rep accessories in Westside for Skinny Bastards are two good examples. It's generally true, though, that you won't get stronger at your 1-rep max lifting less than it if you train too much lighter than your 1-rep max. In short, strength is general - but training for pure maximal strength won't get you same adaptations that training for strength-endurance will get you. And vice-versa.